Taking care of your body should be at the top of your priorities! Massage therapy is a great mind and body treatment. Not only is it a luxurious treat and an excuse to pamper youself, but also a powerful ally in your healthcare regimen. Stress is universal, although it’s not always bad. However living a busy lifestyle, being constantly exposed to daily stressors, and not giving yourself time to rest and recouperate may result in a build up of stress and cortisol. Cortisol is a stress hormone that’s released into the blood to control the body’s sugar and levels and blood pressure. Too much cortisol over a prolonged period of time can cause muscle weakness, hypertension and unwanted behavioural changes and mood swings. Examples of this could be; taking up smoking, loss of appetite, irritability or even depression. Addtionally, physical factors such as carrying extra weight, poor posture or even a dodgy exercise session can put strain on your muscles and make you feel sore and stiff. Fortunately, we are here to help. What better way to eliminate muscle pain and release those feel-good hormones than to get yourself down to Aesthetisc of Essex for an amazing body massage. Take a well-earned break and give yourself a little TLC with one of our massage treatments – and who knows, you may find your levels of concentration and sleep quality have enhanced after your very first session! Who wouldn’t want to experience a great nights sleep? We have many variations of massage on offer, performed by our trained therapists, with your preferences in mind. The various pressure and techniques used during a massage warms and stretchs muscle tissue to drain away toxins, such as lactic acid, and allows fresh blood flow to the muscles. It increases joint flexibility and softens muscle tissue, so you won’t have to experience cramp! But that’s not all, it can also stimulate lymph flow – the body’s natural defence system – enhancing immunity and overall health. And the long term effects of massage therapy are more than skin deep! 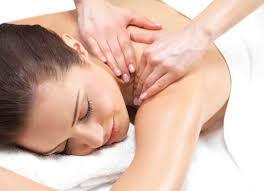 Regular massage sessions can enhance blood flow around the body and through the congested areas. So for those of you suffering from high blood pressure or poor circulation, a weekly massage is all you need for an improved, healthier lifestyle. Unwind with us at Aesthetics of Essex. Contact us today to make a booking or for more informtion about our treatments or products.